I’m not sure why some days it takes so much more time than others to get my act together and get out of Dodge. Today, it was close to noon by the time we were all situated and ready to roll and then it was only two blocks down to the grocery store for another stop to shop. The day started out o.k. The drive was uninspiring going down the pothole riddled I-95 with all of the truckers and snow birds fleeing south. 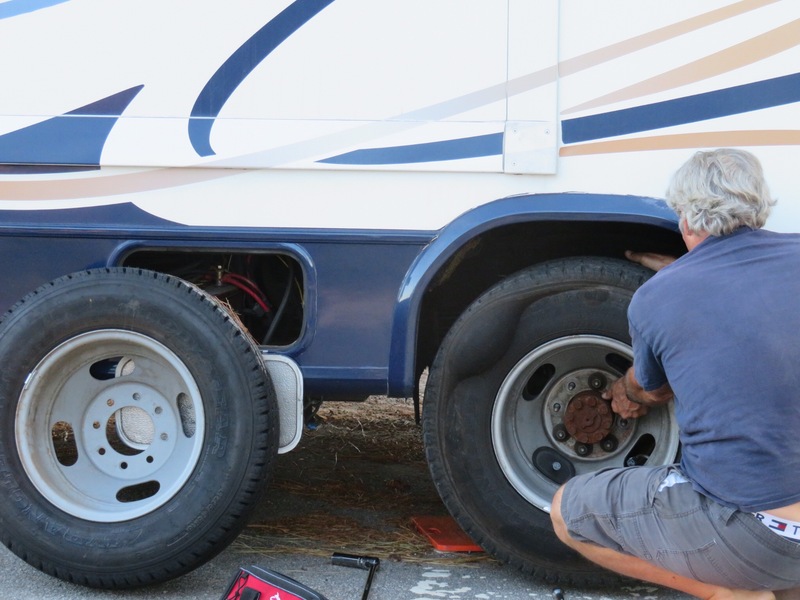 Just across the Georgia line, the monitor on the Tire-Minder pressure sensor started beeping, claiming that a sensor was offline. We exited the highway and I removed and replaced the sensor and it began working again. Everything seemed in order, so we got back on and continued towards Savannah. 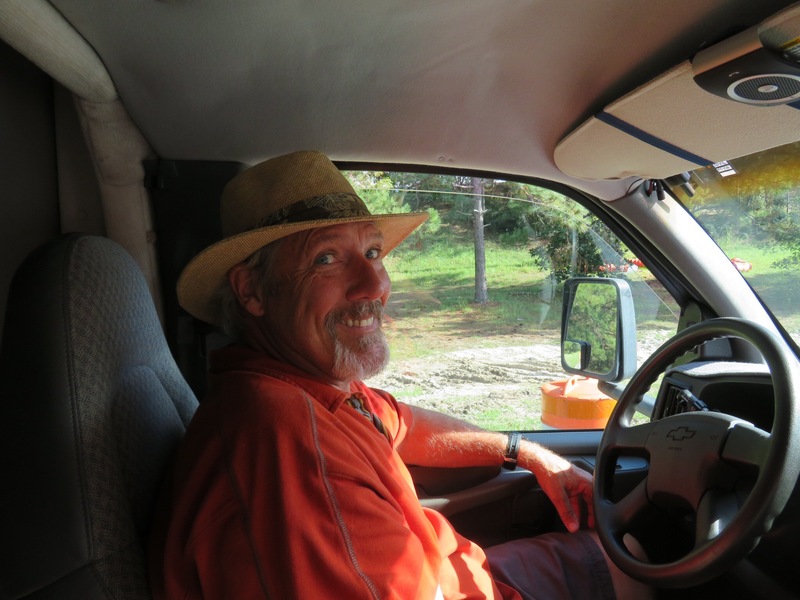 The RV seemed to shake a little and I was feeling a little unsettled. 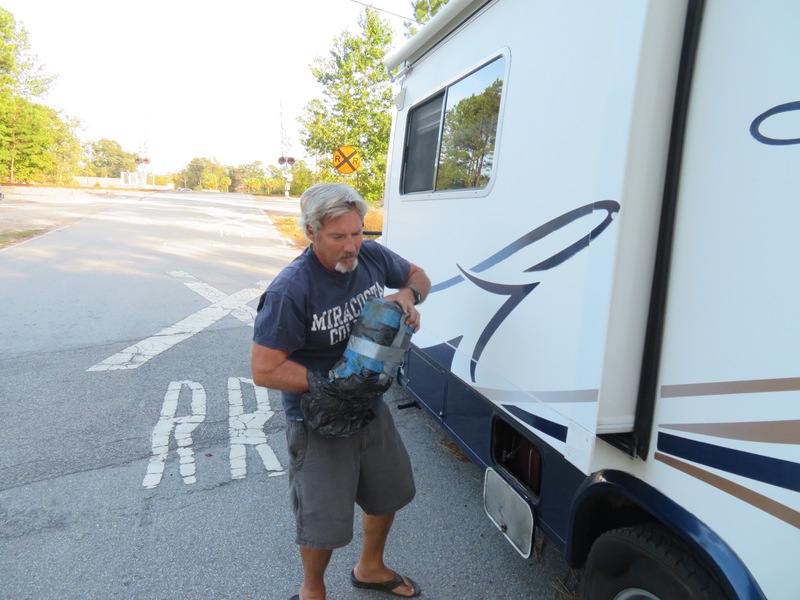 We took the ramp off of I-95 to the Georgia 21 and we were happy to be approaching our destination when a trucker pulled up along side honking his horn and pointing towards the rear of the RV. 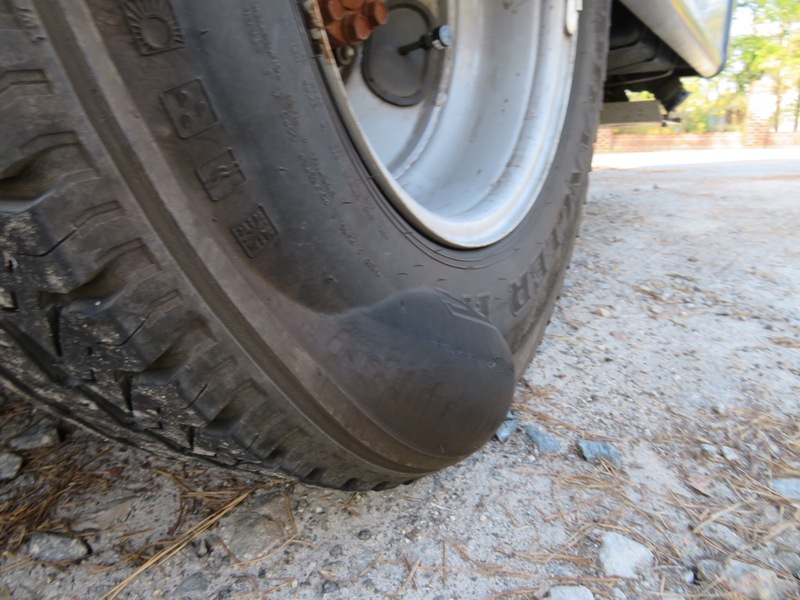 As I got out on the shoulder, I saw a huge aneurysm on the outside rear driver’s side tire – a bubble the size of a softball. We limped down the shoulder to a little side street and parked on the quiet little lane. 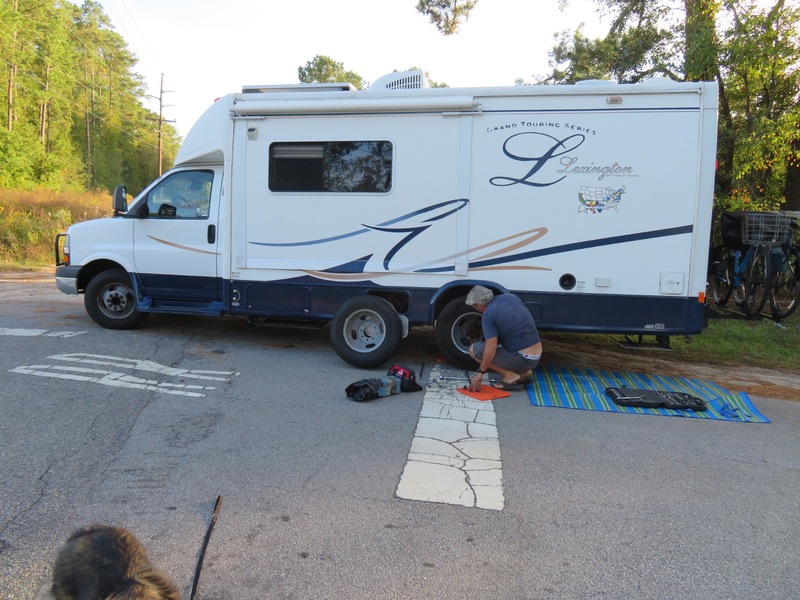 No problem, I paid all that extra cash for the AAA premier roadside service including the premium for RV coverage. I called them up and they linked me to the Georgia version of AAA. I explained the situation and they put me on hold for 10 minutes. The woman comes back on to tell me that there is nobody available to help out. She says she’ll call back in 15 minutes and give me an estimate on when a service truck will arrive. 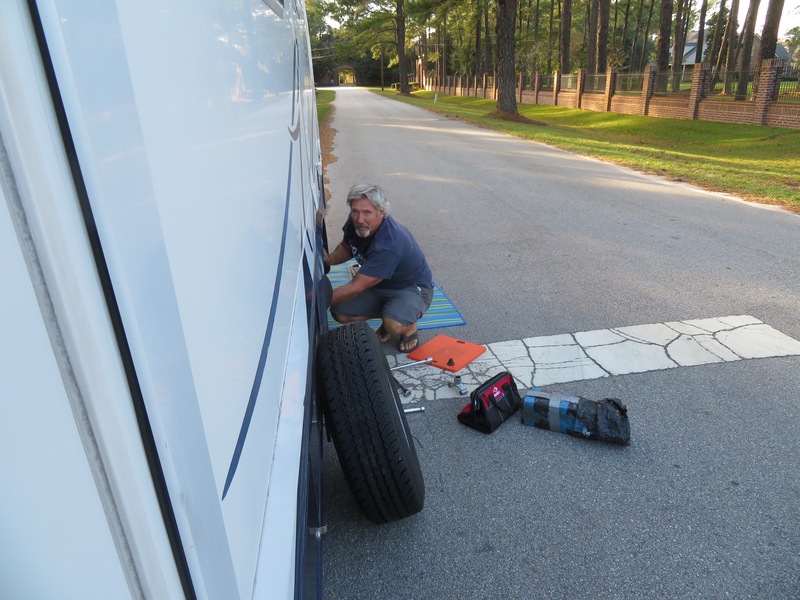 Twenty minutes later, she calls back to tell me nobody in Savannah, Georgia is capable of changing an RV tire and she’ll keep trying and call me back when she finds someone willing to do the job. An hour after we stopped, I get out to do it myself. PJ calls the main number in CA and says my husband’s getting out to do it himself and she doesn’t want that to happen. 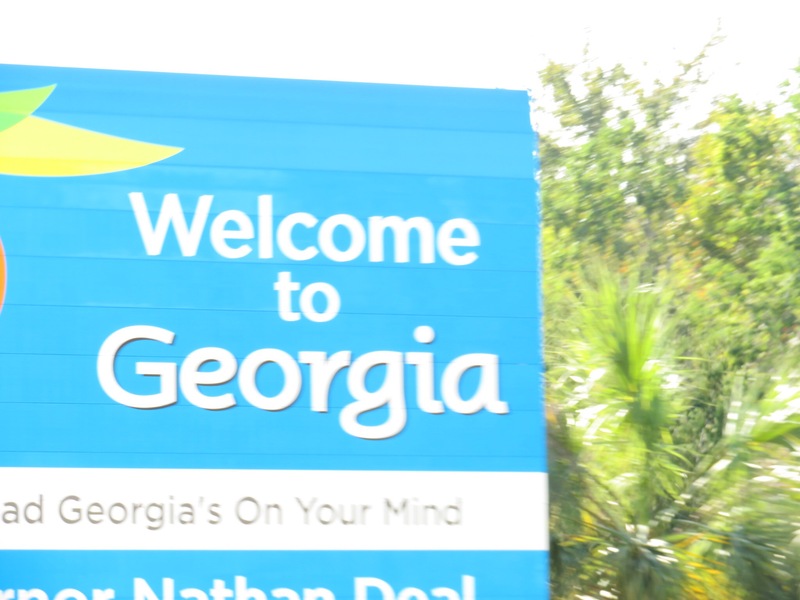 They say they’ll call Georgia and see what’s what. Almost immediately, I get a call and the lady tells me a truck will be there in two and a half hours. Two and a half hours! 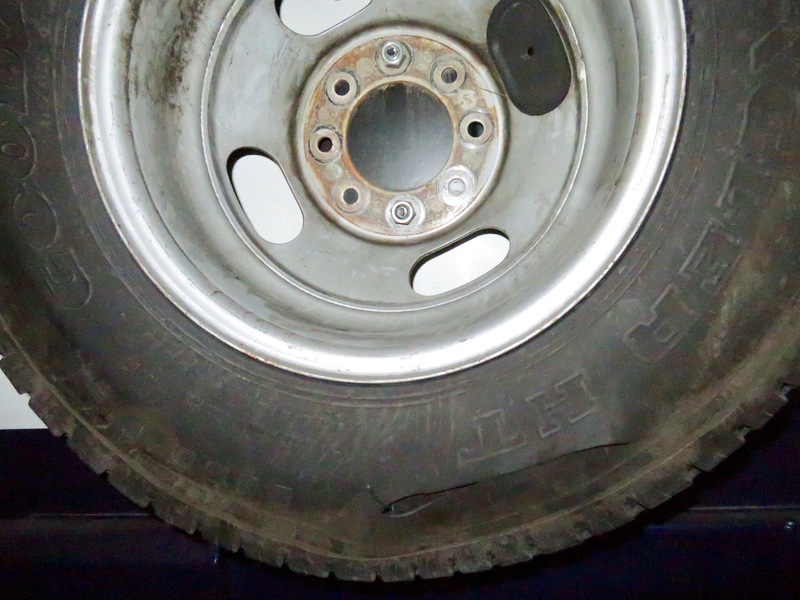 It was little before 4:00 when we realized the tire was jacked and I called them the first time. It is now 5:10 and they are saying two and a half more hours. AAA really disappointed. Three and a half hours to wait for roadside assistance is inexcusable. Good thing I wasn’t an elderly woman on the way to her dialysis appointment, I’d be dead. Should have gone with Good Sam’s. I threw on an old t-shirt, pulled out the jack and got to work. Unfortunately, the jack accessory kit I got for Christmas with the attachments for safely cradling the round axle were made for a smaller sized jack top and wouldn’t slide over the wider round cap on this jack. I jacked it up on the center of the axle and it seemed stable enough. The new in the box, 12 ton jack that came with Lexi worked admirably and we had the spare on in quick order. The Red Gate RV park was only ten miles further down the road and we arrived a few minutes after six. The office was closed but PJ had called ahead while I was working on the tire and they had check in paperwork waiting on the counter in the lounge area with our name and a site number on it. What a relief it was to finally be parked up for the night. 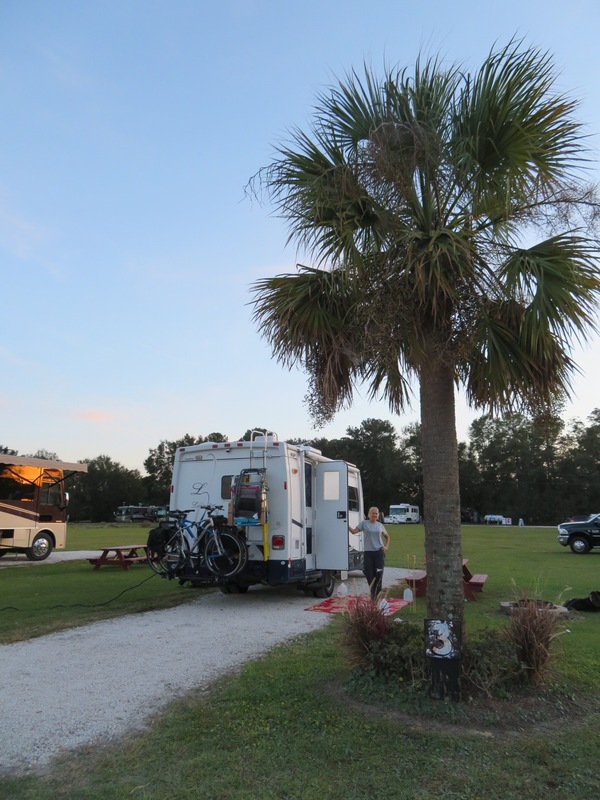 This campground is the closest to downtown Savannah’s historic district. The sites circle the wagons around a huge grassy area about the size of a football field. The vibe is mellow and the neighbors came out to greet us. There are stables with horses, a volleyball court and a large pool. I’ll explore more tomorrow but for now a shower and some dinner are all that is on my mind. Oh, and Georgia, of course.